(COVINGTON, La.) — With its refreshing art style, impressive soundtrack, and dynamic set of characters “Spider-Man: Into the Spider-Verse” is not just another typical Spider-Man movie. The film follows teenager Miles Morales as he becomes the web-slinger of his own dimension, but Miles soon learns that he isn’t the only individual gifted with powers as he meets Peter B. Parker, an experienced Spider-Man of another dimension. Peter B. Parker is brought to Miles’ dimension by the main antagonist Kingpin’s somewhat evil plan. Kingpin is a particularly in-depth character in the film because of his motivation. He plans to bring back his deceased family by transporting them from an alternate dimension. Now while this is not inherently evil, he attempts this by any means necessary, even resorting to even murder in an attempt to see his family again. As Peter B. Parker and Miles figure out the multidimensional predicament they have wound up in, they end up learning from each other along the way. Peter B. Parker teaches Miles the basics of being Spider-Man, enabling the two to form a strong teacher/student bond and friendship. The two characters show their dynamic and round characteristics by evolving from complete strangers into friends that teach each other to take a leap of faith when necessary. Miles’ leap of faith was embracing his powers as best he can to be his own Spider-Man. Besides the movie’s well-developed characters, we see an uncommon art style that pays homage to the story’s comic book origin. Most animated movies employ either the traditional hand-drawn style, 2D vector-based animation, or 3D computer generated image animation. 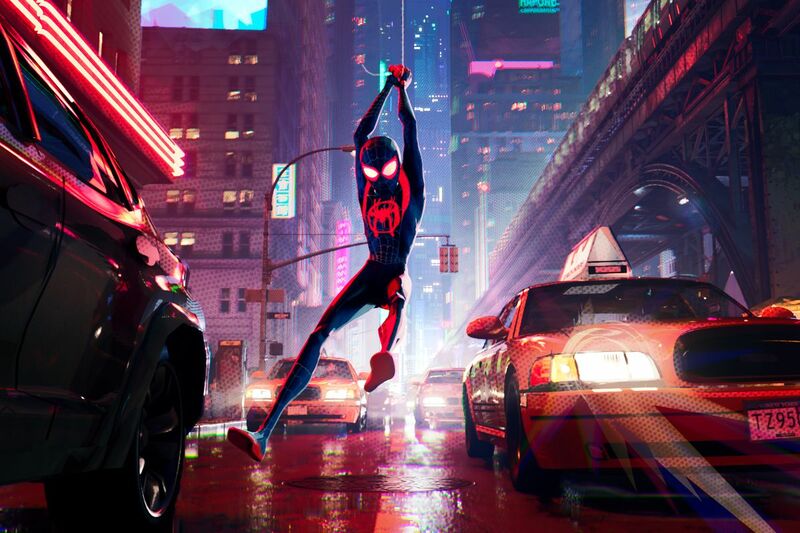 While some movies stand out by using claymation and stop motion animation, “Into the Spider-Verse” stands out from past Spider-Man adaptations by using a mixture of hand-drawn, 2D, and 3D animation styles to create that classic comic book aesthetic. With well-developed characters and an impressive animation style, a soundtrack from multiple talented artists drives home the film’s individuality and spectacularity. The soundtrack is a 13 track album with works from most notably Post Malone, Lil Wayne, Nicki Minaj, Juice WRLD, Ty Dolla $ign, and XXXTentacion. “Sunflower” was a lead single released on October 18th, and continues to be the soundtrack’s most popular song. The catchy single even placed at number one on the Billboard Hot 100, cementing its popularity. “Familia” is another song off of the soundtrack that stands out because of the interesting blend of Latin-trap, hip-hop, and reggae musical elements. Anuel AA, a Puerto Rican rapper, adds flare to the song with Spanish rap verses, while Minaj raps in mostly English. Bantu, a Zimbabwean singer, songwriter, and producer sings the chorus. These songs are just a glimpse of the variety encompassed by the soundtrack. The film has already won multiple well-deserved awards including the Golden Globe Award for Best Animated Feature Film. However, what makes the movie especially appealing to all audiences is the resounding moral theme. Directors Peter Ramsay, Rodney Rothman, and Robert Persichetti Jr. held the idea that anyone could wear the mask when making the movie. Miles Morales is an Afro-Latino teenager who represents that core idea of diversity and heroism. Thank you, Landon, for this informative, well-written and entertaining review. The amount of detail you provide is impressive, and your use of literary analysis terms (round and dynamic characters, character motivation, etc.) affirms the English teacher in me. The technical details concerning the animation sail over my comprehension, but I found the sound track info intriguing. (Are there really groups named Juice WRLD, Ty Dolla $ign, and XXXTentaciona?) And I even listened to “Sunflower’ ( “You’ll be left in the dust unless I stuck by ya”). All in all, this modern day competition to Charles Dickens is formidable indeed. Again, congrats on your article! Keep writing!